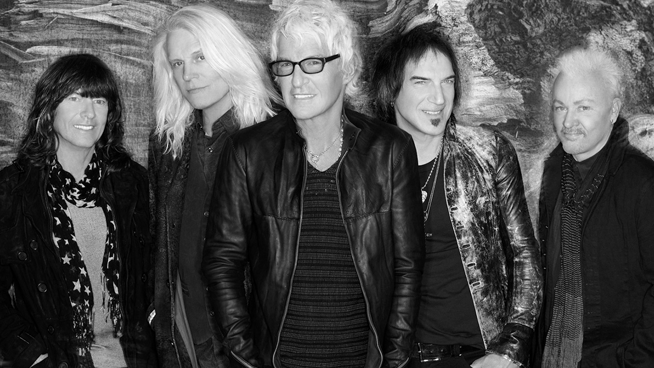 REO Speedwagon brings one incredible night of music to the Topeka Performing Arts Center on May 4! You could win tickets to the show! Just listen for your cue to call on the Afternoon Show with Ethan Jackson, April 8-12th from 2pm to 5pm, and you could walk away with two tickets to see REO Speedwagon! By the early ‘70s, REO Speedwagon’s unrelenting drive, as well as non-stop touring and recording, jump-started the burgeoning rock movement in the Midwest. It carved a path that was eventually followed by STYX, Kansas, Cheap Trick and more. Platinum albums and freeform FM radio staples such as “Ridin’ The Storm Out” followed, setting the stage for 1980’s explosive Hi Infidelity. REO rode the top of the charts with a RIAA-certified 22 million albums sold in the U.S. and 40 million around the globe, with a string of gold and platinum records and international hit singles. Hi Infidelity’s millions in sales were fueled by massive hit singles such as “Keep On Loving You” and “Take It On the Run.” Thirty–plus years later, the nine-times certified platinum Hi Infidelity still remains a high-water mark for rock bands; the album spent 15 weeks in the #1 slot, a feat simply unattainable in music today. Even now, fully established with songs on the radio in every city and town they ever set foot in, REO Speedwagon still has that Midwest work ethic. The band has gone on stage and in the studio to work– dozens of albums, thousands of concerts, and countless radio spins. Their eyes have always been on the future and on the road – taking good care of their legacy while defining excellence in song craftsmanship and brilliant live performance spanning several generations of fans. Check out their performance of “Take It On The Run’ from their stop in Kansas City this past summer.